Where in the world was UNDOF? Judging by some of your comments on our recent updates on the attempted Syrian infiltration of Israel’s northern borders on June 5th and the previous one on May 15th, I’m not the only one wondering where the UNDOF forces stationed in the Golan Heights were on both those days and why they made no attempt to prevent or disband these obvious provocations. As we have previously pointed out, UNDOF has a post very near to the site of the attempted infiltrations near Majdal Shams and its main camp on the Israeli side – Camp Ziouani – is literally meters away from the site of last Sunday’s riots at Kuneitra. I therefore decided to try to solve the mystery myself and picked up the phone to call the Observer Group Golan’s headquarters in Tiberias. There was no reply. I then telephoned the UN’s offices in Jerusalem, asking for an alternative relevant phone number and managed to reach the OGG’s Liaison Officer on his cell phone. Not his department, it seemed: I would have to speak to the Liaison Officer in the Golan itself. Could he give me that phone number? No – he didn’t remember it and happened to be out of the office. So I called the UN office in Jerusalem again and asked for that number. After some searching around, I was given the phone number of the UNDOF headquarters in Damascus and that of the Duty Officer at the Golan Camp – a Syrian telephone number. So I called there, but unfortunately was not able to make much progress as whoever answered the telephone only spoke Arabic. Why did UNDOF not act during the events of May 15th and June 5th? Does the UN intend to investigate its own failure to prevent unnecessary loss of life on both those occasions? What steps is UNDOF taking to prepare for any future events of this nature? I will keep readers updated if I get a reply. “Something in the futility of the protests – the way the demonstrators were stuck at the razor wire perhaps – conjured echoes of the vulnerability and pathos of soldiers fighting in World War I. Except, of course, that the groups we watched carried no firearms”. “And the Israel of Majdal Shams hardly seems like the Jewish David ranged against the collective Goliath of the Arab world”. I am hoping you can post from your close up experience of this event, a refutation of this odious man. Actually the UNDOF mandate is as an observer. It is not empowered to intervene militarily. And whose idea was that? Which country doesn’t trust the UN? You guess it! The ‘Jewish and Democratic’ State! @ Sanity so assuming UNDOF had power to intervene militarily against apparent civilians (it is apparently mandated to intervene against military personnel), how should it have dealt with the crowd? @ Israelinurse why not get an Arabic speaker to call that second number again? Seems more promising. ‘Sanity’ – Included in UNDOF’s mandate is to “Maintain the ceasefire between Israel and Syria”. It is obvious that attempts by Syrians to breach the border will lead to incidents. If for some reason it wasn’t obvious before the first event on May 15th, it should have been clear after that. It is equally obvious that these attempted infiltrations took place with the encouragement and approval of the Assad regime – i.e. they were state sanctioned. That is a fact which is likely to endanger the ceasefire. 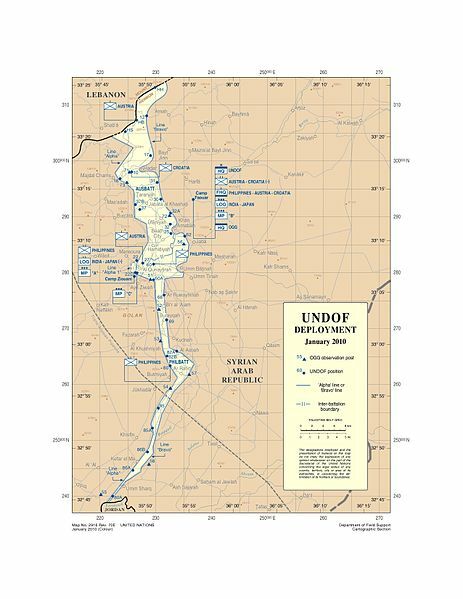 Another clause in UNDOF’s mandate is to “supervise the areas of separation and limitation, as provided in the May 1974 Agreement on Disengagement” – that means the region of no-man’s land between the two borders: an area which the Syrian infiltrators should have been prevented from entering. It is precisely incidents like these attempted border infiltrations which are likely to tip the balance between ‘tense’ and all-out conflict. UNDOF intervention did not have to be military; it has offices in Damascus and could have intervened prior to these well-advertised provocations setting out. It could have pressured the Syrian regime into not permitting them to take place. It could have prevented the infiltrators from even reaching the Israeli side of the border – but it failed to do any of these things. As in Lebanon, UN forces stood by and watched whilst tensions in the region once more escalate: little wonder then that after Hizbollah armed and re-armed under the UN’s noses, Israel has little faith in the efficacy of the increasingly ridiculous fig-leaves named UNDOF and UNIFIL. Israel does not allow UN forces the authority to intervene. Full stop. If Israel wants real UN troops, not just observers, then it should give them the authority to do so through the UNSC. Until then you should all stop crying foul, and stop shooting unarmed protesters who are stooges for the Syrian fascists and who pose zero threat to Israel’s security. How do you know that they “pose zero threat”? Being as well informed as you claim to be, you are no doubt aware that some residents of Majdal Shams reported that some of the Syrians who managed to get into Majdal Shams on May 15th requested weapons from the locals with the intention of carrying out terror attacks. On June 5th at least two of the rioters were seen to have guns and many others threw Molotov cocktails – those are weapons. You will also be aware that Hamas, the PFLP and PFLP GC all thrive in Syria – what would be the problem to send a few recruits into Israel together with a hundred or so others? Your flippant attitude towards Israeli lives is disgusting. Good grief, you are bone headed. Well, even the Israeli establishment is coming round to my point of view. You know, there is another way where killing people isn’t the answer to all problems. Good grief, you do flatter yourself. One journalist is hardly ‘the Israeli establishment’, or any other establishment for that matter. It may not matter to him or you if Syrian infiltrators are wandering around unknown at will, but I’m guessing neither of you live in a place where such a scenario could really be of meaning. There must be a reason why you fail to discern between ‘unarmed protesters’ and ‘violent mobs storming border crossings’. Is that because this klind of disinformation chimes with your agenda? No doubt you have been emboldened by the world’s press and news editors. Their irresponsibility is criminal – although we can thank them in this instance for outing you as either a fool, a racist bigot, or both.